Dateline: October 6, 2005, at Justin’s Music in Detroit, MI. When God gave her “Purified” she didn’t know that Hurricane Katrina was going to happen, but she found out that the word “Katrina” comes from the Greek word catharsis, which means cleansing or purified. She took this as a sign that this project is for this time. DG.com: How does it make you feel having won so many awards? CeCe: It always feels good to win an award because it validates you amongst your peers. Awards are good, but that’s not why I do it. I’m not even aware of how many awards – but I do it because I am a servant. CeCe: This song is just letting you know that for people who feel like they can’t pray, because they’ve messed up and made mistakes, it doesn’t matter what you’ve done or what you’ve gone through, God is still waiting to hear your prayer. If you believe it, He’s going to answer your prayer, so pray. Question: What would you say to people who think you don’t have problems or have made it? CeCe: First of all, a lot of people do think because you’re on television or on a magazine that you’re not going through anything. Really, when you’re on the front line, the enemy comes after you harder, more. But, I can say that we go through rough times. You go through times when you’re crying. I have to do what I tell everybody else to do. I have to just get in His presence and to stay there and I have to get in my word and that’s the way you continue to go through. It’s by being obedient to God’s word. So a lot of time people think they can get around being obedient, but you can’t. You have to obey His word; you have stay in prayer, fast, do whatever it takes to get the victory in that area. Because we are more than conquerors, but we have to conquer it the way God told us to conquer it. We go through things. We go through rough things, just like the passing of my brother, just a few months ago. I never thought I would live life without Ronald. We don’t grieve like the world, because I know I’m going to see him again (applause). We will worship again together. But, it’s hard, because you’ve lost a loved one and we’re sad sometimes, but we don’t stay sad long. The amazing thing is the joy of the Lord is your strength and it never leaves you no matter what you’re going through. People say, “Are you ever down?” I’m down sometimes, but I don’t stay down long, because when I think of the goodness of Jesus and all that He’s done for me, I can’t stay depressed. I don’t understand depressed saints. No, I really don’t, because when you really zero in on who God is, you can’t help but rejoice! Question: What advice [do you have] for aspiring artists who may be ministering in the church now, but feel called to be a professional artist? CeCe: That’s kind of a hard question, because it happens differently for everybody, for the most part. My first word of advice would be to seek the Lord. You know, people get tired of my answers, because my answers always say the same thing, but it’s the truth. You seek the Lord. Just because you might want to do it, but it may be that God has not called you to do it. So it may be a lot of times you may say, ‘I won’t do that.’ If it’s not the center of God’s plan for your life, then it’s not going to be good for you. And once you do that, and say, ‘yes, … I know God has called me beyond a shadow of a doubt to sing music– to be an artist,’ when you know, that you know, that you know. And even when you know, you have to still fight doubt at times, because you’re going to have a hard time sometimes. God allows us to go through that so we can learn through it how to trust Him more. When you know you’ve been called, you have to know that God is going to open up every door that needs to be opened. And for me, I’ve learned to thank God for all the doors that have been opened and for all the doors that closed (applause). [Also] you know you can put your songs on a tape and send them out to different record labels. They’re always looking for new talent. [Finally,] worship where you are. If it’s in your church choir, be faithful over that. You know the bible tells us, ‘if you’re faithful over a few things, then I’ll make you ruler over many.’ And, so a lot times we just—we want to do it in our own time, but you have to wait on God and do it in His time. If He’s called you to do it, rest in that. Know that it is going to come to pass. Question: How did you start your record label? CeCe: You know this is a good question, because I have a great answer for you, especially since we were talking about how people go through things. I had put out the CD, “Everlasting Love” (shouting and applause). I had a great time doing that CD with Tommy Simms, we had a great time. We were on a record label called Pioneer. It had just started a Japanese- owned label and we were on tour with Kirk Franklin at the time. I got a call telling me that the record label was going under, it was going to fold. I sat on the bus and I said wow, the record label is about to fold up. I told my husband, ‘God must be up to something.’ So I went back to Nashville. The people I worked with, the accountants, they looked at me and they were like, ‘Why don’t you just start your own?’ I said, ‘Start my own!’ They looked at me and they said, ‘Yes, start your own.’ So, I’m sharing this because where other people would have panicked– and that seems like a bad thing for your company to close, it turned out to be the greatest blessing of my life (applause). To start my own company, to start my own label [Pure Springs Gospel]. I knew I would, but I didn’t think it would be this soon. So I said, ‘Let me pursue it.’ So, I said, ‘Let’s do it!’ The Lord started bringing incredible people in my life to run the company. ‘Alabaster Box’ was the first CD we put out on the label that went platinum…(applause)…that went platinum! It is still selling (applause). God is so amazing. He’ll turn that thing that the enemy meant for wrong into something good, something great in your life. That’s how I started it. It’ s doing well. It’s been about 5 or 6 years now. We have about three artists on there. Maybe by next year we’ll have two more, but we’ve been doing it slow and we’ve been doing that on purpose, because we’re trying to do it right. So that takes time. That’s the story behind starting my record label. Question: What about your conference ministering to young girls? CeCe: I’m so happy you asked me that! You guys are good and your questions are great! I’m so happy you asked me that because I’m about to have my first Girl Conference – October 21st and 22nd (applause) in Nashville, Tennessee for girls the ages from 13 all the way up to young adults to 25 and 26, something like that. So, I am so excited about that, but you know if we don’t “pour” into the younger generation, who will? They are taking all their cues from all the wrong places; to the video channels… They need to learn how to dress holy, how to act holy, how to do all that (applause). So, I’m really excited about that and if you want to know more about that you can log onto www.alwayssisters.com. Its called “Always Sisters Conference.” We’re going to address everything from eating disorders, to living with AIDS; we’re losing a lot of our kids to suicide. We can’t just sit back and let that happen anymore. So, be in prayer about that with me. I’m really excited about that. 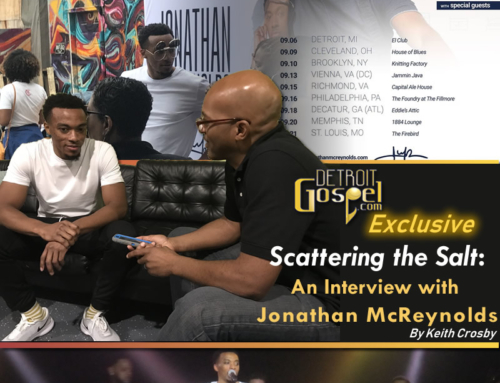 Kirk Franklin is going to speak to the girls from a brother’s point of view, then I have a pastor who is speaking about what girls go through– a lot of things, because their fathers are not in place, so they look for love in all the wrong places. We’re going to talk about business, running your own businesses. I’m really excited about that! That’s my baby right there, so pray for me. Question: Where do you see gospel music in the next 5 years? CeCe: Well, I think you see a lot of good in gospel music. We need more. We need more, but it’s going to take all of us in this room to decide that. Everybody—that is we have to learn how to support one another. We have to learn how to groom our kids, those who want to go into it. We have to learn how to connect, even like tonight learning how to connect with you guys being here means connecting with the store owners. When we come together, there’s power in that. You can look at the country industry and where they came from and where they are now. We’ve got to get more outlets, need more radio stations. We need more concerts on the road and that’s one of the reasons why we didn’t just start a record label, but we started an entertainment company, because I want to put tours on the road. I want to put the right kind of promotion. But you know what guys, we have to be willing to invest in our own (applause). We have to be willing to sow seeds. Then it will continue to grow, because if not, we will lose it. It will just be a spurt. So, it may just be one. You may see me a lot or you might see Yolanda. I know Yolanda was just here and you see different people. You know, there are a whole lot of other people out here with incredible talent, but because we don’t have the system built to carry all of them the way they should be carried and treated, you don’t hear about them and they get left out. It’s just not fair, it’s just not right. But if we, the gospel community, don’t start buying CDs and start buying the tickets to the concerts and start making the world hear us, then we will lose it. So, are we going to do better everybody in here (applause)?! Tell somebody about it! Call into the radio stations and start requesting it! We have to start working together as a team in order that gospel can be heard by the world. 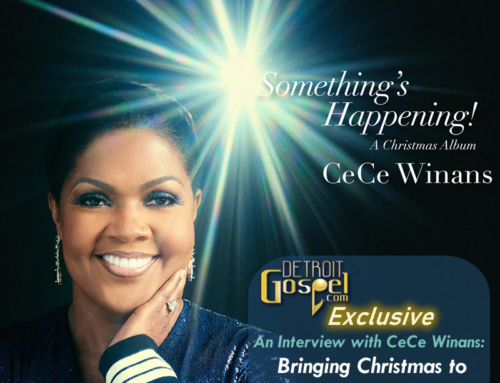 In closing, gracious to the end, CeCe thanked God for people like those in attendance, and outlets like Detroit Gospel.com, who help get the word out.